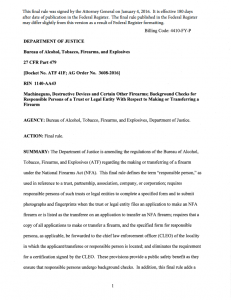 The Bureau of Alcohol, Tobacco, Firearms and Explosives (ATF) approved the long awaited proposed rule change dealing with fingerprints, photos and CLEO approval on NFA transfers. The final rule is both a step forward and backwards for future ownership of NFA items. NFA forms 1, 4 and 5 will no longer require Chief Law Enforcement Officer certification (CLEO). They will, however, require CLEO notification. All “Responsible Persons” will be required to submit a set of fingerprints, photos and personal information. For those with gun trusts, this most likely means all trustees. ATF defined those who they consider to be “Responsible Persons” with NFA items – defined below. Minor beneficiaries will not be required to submit fingerprints, photo and other personal information. ATF NFA branch is only reviewing applications as part of transferring an NFA item – not upon the addition of a responsible person after an application is approved. ATF will begin implementing these changes in 180 days. Currently pending applications should be grandfathered…more to come on this point. Whether you have a gun trust, are in the process of setting one up or just thinking about getting one, I don’t expect these changes to make a substantive impact on the flow of NFA items. The CLEO signature has long been a massive hurdle to many in acquiring NFA items. With the change to notification rather than certification, I actually expect the number of NFA purchases to increase. Given that form 4 transfers take 5+ months, getting a set of fingerprints and two photos (which might take a little over an hour) isn’t going to upend the entire NFA business. I’ve spoken with three clients this morning who are NFA manufacturers and every single one of them is optimistic about the future of NFA sales, especially considering the CLEO certification removal. If you already have a gun trust, taking a look at the number of trustees you have on your trust to make sure you have a simple setup that allows for solid estate planning but simple enough to make the application process burdensome is a prudent step. I have long recommended to my clients to keep their trusts simple, limiting trustees to no more than two or three individuals. After one goes through a period of acquisition to their trust, they can then later add trustees if their trust allows. If you need your trust looked at or modified, please feel free to contact me. As every person’s situation is unique, connecting with your lawyer on your gun trust is a good thing to do. 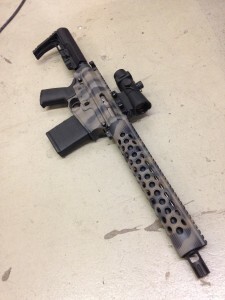 I still strongly believe that acquiring NFA items through a gun trust is a sound and responsible means of ownership. While it was convenient to avoid the CLEO/fingerprint/photo steps in the past, the multi-person access (through Responsible Person Trustees) and estate planning provisions allowing transfer to your beneficiaries after death are two excellent reasons to use an NFA gun trust. The gun trust is a solid option to avoid the situation where a loved one (the wife in my scenario) accidentally takes possession of the NFA item and inadvertently commits a felony by not being an authorized responsible person. Throughout the rule, the ATF makes clear “this final rule has been revised from the proposed rule to eliminate the requirement for a certification signed by a CLEO and instead add a CLEO notification requirement.” For many, this has been a major sticking point and impetus to getting an NFA gun trust. Does this mean that every time i get a new suppressor through my trust, that we all have to submit photos and fingerprints as well as notify the CLEO or does BATFE keep that on file for future reference? Yes, every time you submit an application, the application will need to be complete. I am not aware of any ability to keep things on file with the ATF. So will items currently owned by my trust be governed by this rule? Meaning, do I now have to submit photos and fingerprints of myself and my trustees, or will already owned items be exempt? Yes, items that are currently owned are presently exempted. Any future transfer of those items would be governed by these provisions. And will this action by the ATF be effective immediately? Or is there a date when this will take effect? They said 180 days. No exact date.